A crunchy mixture of chocolate and peanut butter coated rice cereal squares. A sweet Halloween treat loaded with tons of candy. Chocolate and peanut butter is the best combination ever. Period! I’m sorry, but there’s no arguing this point. Sweet chocolate paired with creamy peanutty goodness… foodtopia. If you’ve been keeping up with my posts, then you know how much I love chocolate and peanut butter. There’s the Dark Chocolate Peanut Butter, the Skinny Chocolate Peanut Butter Banana Shake, and, most recently, Milk Chocolate Peanut Butter Hot Chocolate. My addiction has no bounds. 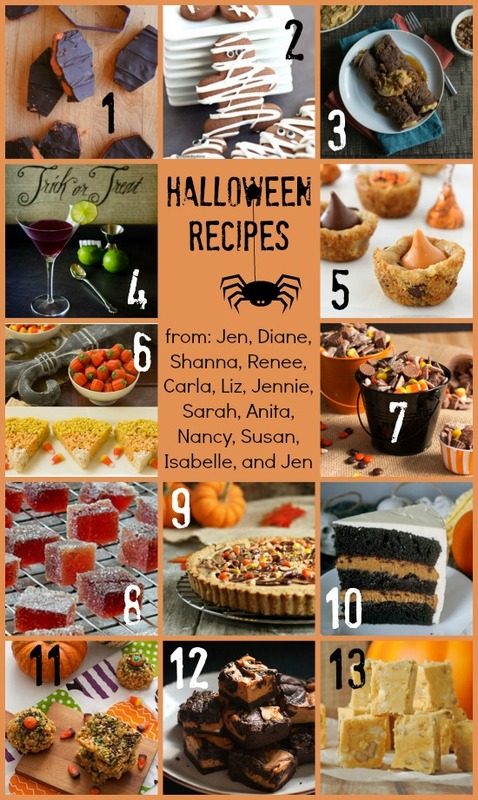 This month, the Holiday Food Party group is celebrating Halloween. I’m always at a loss when it comes to Halloween. I know the holiday is gaining popularity. People are really getting involved in the festivities, decorating their houses, coming up with family-themed costumes, throwing extravagant parties, and even trick-or-treating out of the trunks of their cars. It’s definitely a beloved holiday. Me? Well, I’m lazy when it comes to Halloween. I’m more of a Thanksgiving and Christmas kind of gal. The one thing I do like about Halloween is the candy. Sweet, sweet candy! Chocolate for me, please. I used to hate getting smarties and mini boxes of raisins in my pillow case (the plastic pumpkins couldn’t handle the amount of candy we would receive). What kid wants raisins for Halloween? It really is a cruel joke. 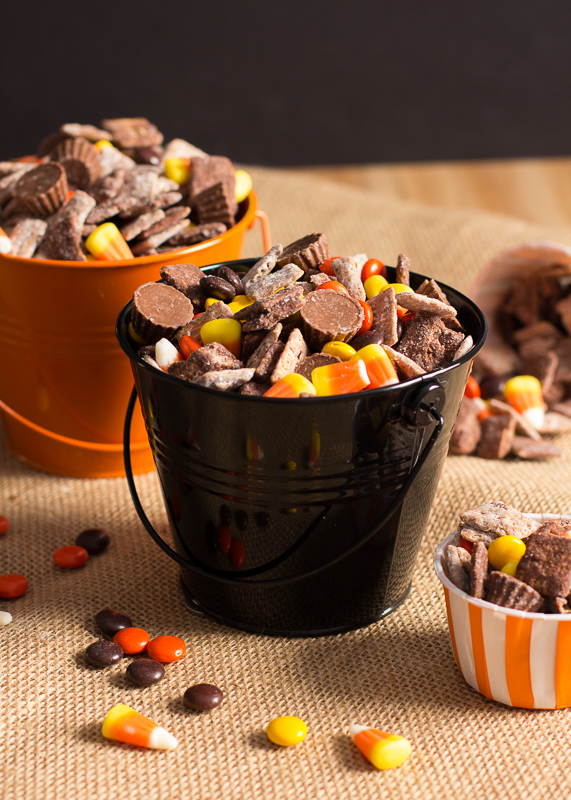 I couldn’t think of a better way to celebrate Halloween then with a big ol’ bowl of chocolate peanut butter puppy chow loaded with candy. Puppy chow is a mixture of rice cereal squares that get coated in a gooey mixture and dusted with sweet powder. I coated my rice squares in melted peanut butter and chocolate, then I dusted half the mixture in powdered sugar and the other half in boxed chocolate cake mix. Mix in your favorite candy and you have yourself a crunchy addiction. Fill up a bowl for a crowd-pleasing snack at your Halloween party or package in individual candy cups to hand out to trick-or-treaters. This crunchy treat will make you the neighborhood favorite for years to come. Because you can never have too much chocolate and peanut butter goodness, I added mini Reese’s peanut butter cups and Reese’s Pieces. Oh my goodness! Place 10 cups of rice cereal into a large bowl. Grab two 1-gallon freezer or storage bags. Place the powdered sugar in one bag and the chocolate cake mix in the other bag. Set aside. Add peanut butter, chocolate chips, and butter to a microwave-safe bowl. Heat the mixture in 30-second increments, stirring in-between, until the mixture is smooth. Pour the creamy peanut butter mixture over the rice cereal squares. Fold the mixture into the squares until evenly coated. Divide the mixture in half, placing one half in the bag with the powdered sugar and the other half in the bag with the chocolate cake mix. Shake the bags vigorously until the squares are evenly dusted. Pour the coated rice squares onto the prepared baking sheets, spreading them out into an even layer. Allow the squares to dry for 30 minutes. Combine the coated rice squares and candy in a large bowl and mix to combine. Serve party style or divide the mixture into individual servings for delicious gifts. Oh, my. This would not be safe in my presence! Best puppy chow ever!!!! It is so not a safe treat to have close by. Oh, but it’s so good. Thanks, Liz. Puppy chow!! 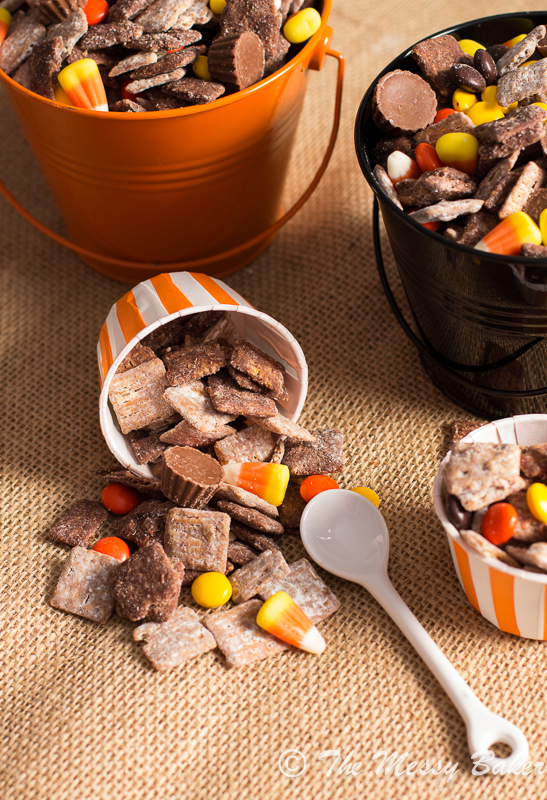 Oh my gosh, this reminds me SO MUCH of growing up and Halloween’s where my mom would sit with us and make puppy chow. Love it. Thanks, Terra! I love mixing up a classic recipe. Thanks, Kayle! I’m a bit biased, but I couldn’t agree more. Lookit all these treats! Ohhh gawl, I want your puppy chow at arms length at all times! This looks so addicting and amazing! I love that some of the cereal is dipped in chocolate cake mix. This wouldn’t last a day around here! My family has been munching on it since Saturday. It really is an addictive snack. Thanks! I could munch on this all day! Girl, you covered half of the cereal with chocolate cake mix?! Your brilliance knows no bounds! I love it! I keep collecting puppy chow recipes to try and this one is now on the top of the list because chocolate & peanut butter, obviously. Wise choice, Nancy. There is nothing better than chocolate and pb together. The cake mix dusted pieces are my favorite. This is so true, Tina. Thanks for stopping by. Pretty sure I wouldn’t be able to keep my hands out of the bowl! This looks so amazing! I usually don’t care for the cereal snack mixes but you have won me over with chocolate and peanut butter. I’ll take a whole pail please!! Chow emergencies must be tended to right away. I’m more of a Thanksgiving and Christmas girl too but I do have a few Halloween decorations to put up and I loooove the candy! I bet this is crazy addictive! I do love me some candy. I have one “Happy Halloween” sign hanging up. I’m so dull. I love puppy chow and this version looks SOOO good. Perfect for halloween! I’m totally with you… Chocolate and PB = BFFs 4evah! :) I love all the bright colours and fun textures in this mix… I have a feeling one of those little buckets would last exactly 2 seconds if it was on my desk right now. What a fun treat for Halloween, Jennie! It looks so delicious and perfect for sinful snacking! This might be the best version of puppy chow I’ve ever seen. I love anything peanut butter and chocolate! after all these years I’ve still never had puppy chow! Oh! I love puppy chow so much and this version looks outstanding! Hi Jennie! 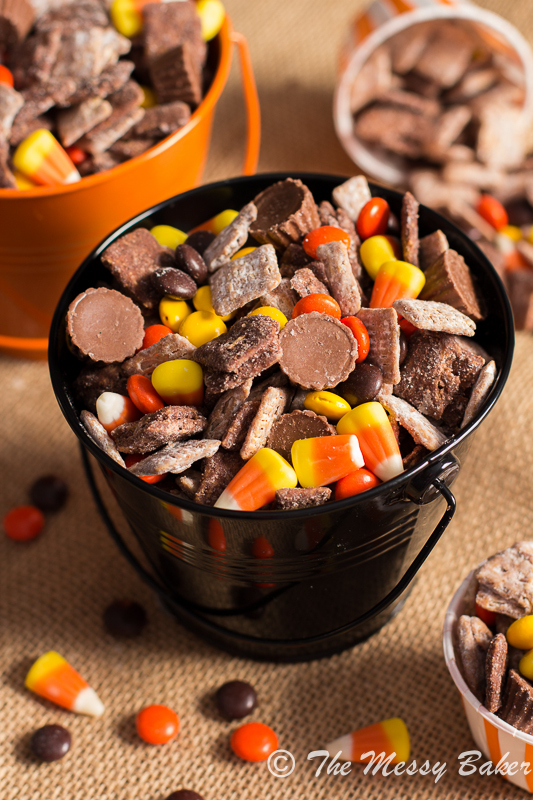 I think this would be such a popular party treat and love how you put them in those cute buckets :) I included them in my blog post today about my favorite Halloween ideas. I don’t think I’ll be able to keep my hands outta this! This is some beautiful and festive puppy chow! I really love the color the candy corn adds to the chow and there are some yummy flavor combinations going on here. I’m saving this recipe! I’m in love! Puppy chow, peanut butter and chocolate, and Halloween? All together for a win! This looks delicious and addictive. Thank you for sharing! Can never say no to a big bowl of puppy chow! What a fun snack idea, LOVE every bit of it, so much so I’m really wishing I was snacking on it right now! this looks way too addicting! I NEED to make this very soon! This is a bucket of crazy deliciousness!!!!!! I don’t think I could live without peanut butter. I literally eat it every day. I’m obsessed! I could probably eat my body weight in this Halloween-themed puppy chow. Totally obsessed with this! Pingback: 21 Simple and Easy Last Minute Halloween Ideas | Homey Oh My!